Takao Akizuki skips school each morning to go to Shinjuku Park. Here he meets a Yukari Yukino, an woman who is also shirking her job to sit alone drinking beer and eating chocolate. Takao dreams of becoming a shoemaker while Yukari has her own problems. 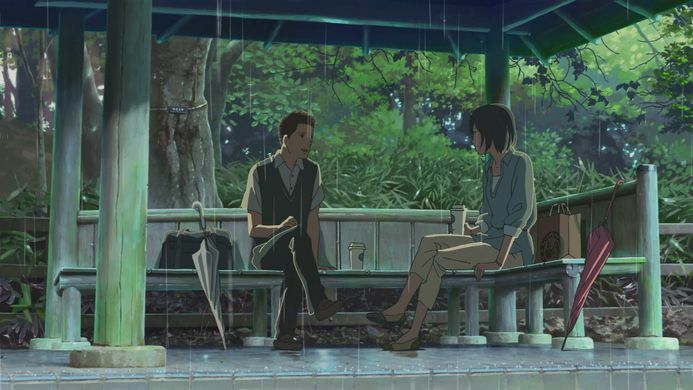 As rainy season begins the two sit together in a park shelter, discussing their lives and learning more about one another, forming an intimate friendship. Writer and director Makoto Shinkai has an instantly recognizable style, with incredibly well-rendered locales and emphasis on the minute details that many would ignore, but which are of paramount importance in creating a sense of place and time. “Garden of Words” is no different in this regard and his depiction of Shinjuku and the park in the middle of the sprawling city is a joy to behold. It is a space that you could spend an eternity in, picking out each droplet of rain and marvelling at the reflections. The art, animation, sound design, and direction all work to build a tangible, living environment. The film is short but this works in its favour considering the story. Where many films would stretch the run time with unnecessary subplots, each scene in “Garden of Words” is poignant and essential in understanding the characters. There is a poetry in the script that compliments the beauty of the imagery. Given the premise of the film, it would be understandable to expect a romantic drama. However, the film is far more subtle, painting a believable and touching vignette of these two characters who simply share time together, influencing each other in a quiet yet important way. In a world grown increasingly cold and isolating, this simple act of sharing a quiet moment becomes almost transcendent. The sublime visuals, and the mesmeric piano score by Daisuke Kashiwa that drifts effortlessly between melancholic and uplifting, create a space in which to contemplate your own thoughts along with the characters. “Garden of Words” is beyond film, it is a truly special piece of art, confident in its message and delicate in its delivery. Mitsuha is a highschool girl living in a remote rural community. A conscientious girl, she takes part in the villages cultural event as a shrine-maiden along with her younger sister and grandmother. But Mitsuha dreams of moving to Tokyo away from the monotony of rural life. Taki is a highschool boy living in Tokyo, the very life that Mitsuha dreams of and the two find themselves inexplicably living each other’s lives. At first they believe that this second life is simply a dream that they struggle to remember on waking, but as the pair’s friends explain to them their bizarre behaviour they begin to understand that what is happening is real. Without knowing each other they have somehow become bound together. As the film progresses there are several twists and turns that take the story in unexpected directions as a disaster threatens Mitsuha’s hometown. Makoto Shinkai (5 Centimeters per Second) has once again directed a stunningly beautiful animation. The world of the film, both rural and urban, is recreated with exceptional skill and an eye for incidental details that help bring it to life. Many of the scenes are works of art, the lakes and mountains of Mitsuha’s home are exquisitely depicted. Shinkai certainly has developed a recognizable style of his own and that is present here, in particular the use of light, with dazzling sunbeams, starlight, dawn and dusk captured brilliantly, though occasionally it becomes excessive and a more restrained approach may have worked better. You can feel the mountain air and the bustle of the city and it is a world that you could happily step right into. RADWIMPS provide several songs for the film and this seems to indicate a step to a more commercial direction for Shinkai. The piano score more reminiscent of earlier works is still here, but there are a number of up-tempo montage sequences, a focus on comedy, and more traditional relationships developed in the subplots that make this a more easily accessible work. The story does a good job of keeping you guessing. Unlike other body-swap movies where the plot is explained in the beginning, the film keeps its secrets until it is ready to reveal them. In the end everything is wrapped up more neatly than some might like, but the way it builds to that moment is so full of emotion that it is forgivable. Both Mitsuha and Taki have entertaining subplots in their own stories and characters that are enjoyable to watch. 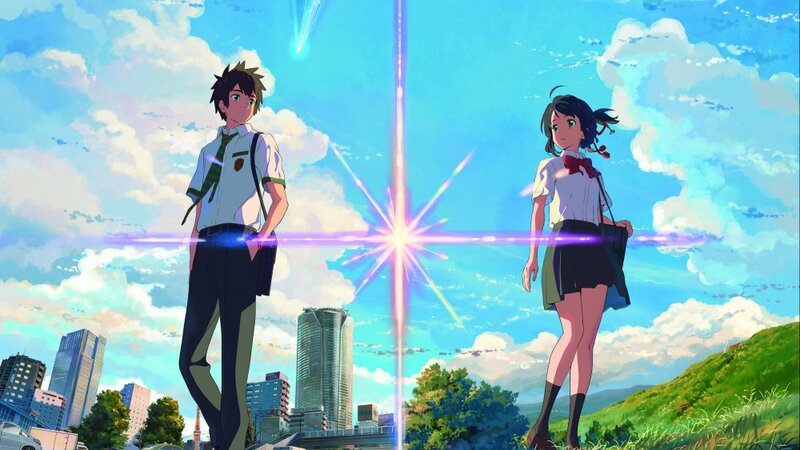 As with Shinkai’s earlier works (Voices of a Distant Star, The Place Promised in our Early Days, 5 Centimeters per Second), “Your Name” deals with a theme of love and a couple sundered by an impossible distance. The characters are always reaching for something that is just out of grasp. In particular when their attempts to call one another fail to connect. The film also contemplates the nature of fate and the inter-connectedness of humanity. Doors opening and closing throughout the film offer a perfect visual metaphor for the choices that guide our lives. The film largely shies away from discussing the transgender themes implied in its premise. These are largely played for laughs with the characters becoming used to each other’s bodies or acting out of character. Nevertheless, that aspect of the film is somewhat unavoidable given the story. There is so much to enjoy about the film, from the incredible animation, deep themes, humour, and a thrilling story that it is definitely worthy of the praise it has garnered. Following an unknown conflict, Hokkaido (now renamed Ezo) has been separated from the rest of Japan. Ezo is now under control of “the Union”, while Japan itself is controlled by the United States. High school friends Hiroki and Takuya are intrigued by a large tower on Hokkaido, that can be seen even as far south as Tokyo. They begin work on a plane that will fly them to the tower, to see what it is. They decide to tell their high school classmate Sayuri about their project, taking her to see the plane. While there, Sayuri looks out towards the tower, seeing a vision of it exploding. The film then shifts to three years later. Sayuri has not been seen for three years, Takuya is working for a government program intending to establish the proposition that there are multiple-universes, one of which is being brought into view by the tower on Ezo. Meanwhile Hiroki has fallen into a depression due to Sayuri’s disappearance. 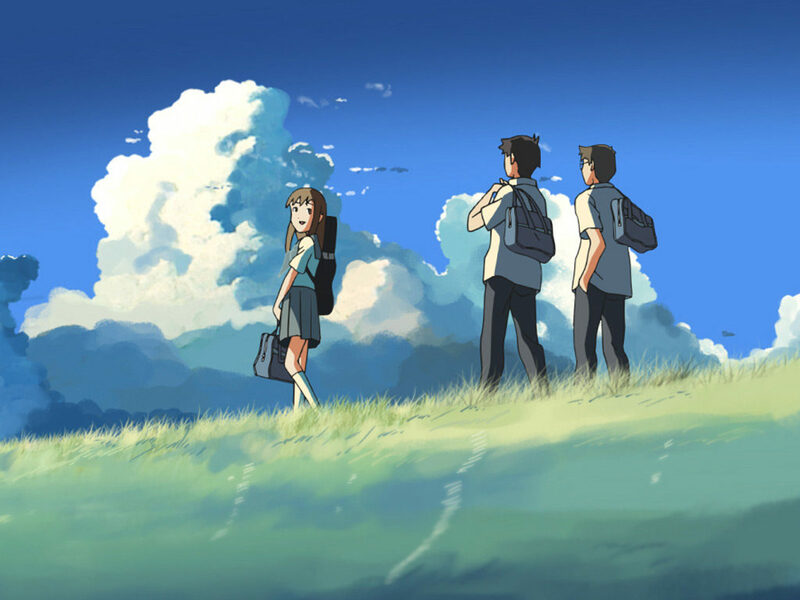 Writer and director Makoto Shinkai has crafted a beautiful film. Although the film does involve a war and talk about multiple-dimensions, the focus is kept largely on the relationships of the three main characters, with everything else serving to move their story forward, or work as a metaphor for their hopes and desires. The animation is truly stunning, with the artists having a great eye for detail, and a real love of the quiet countryside of northern Honshu. The pacing of each scene is judged perfectly, cutting between characters and small details in the environment. There are many short scenes fading to black, which help to cover a lot of time and ground in a relatively short run-time. With minimal dialogue you have a fully realised world. The music matches the animation, transcendently beautiful compositions for piano and violin heightening each emotion. The film is a simple love story, though using various brilliant conceits to further emphasise what the characters are feeling. The tower acts as a symbol of the characters dreams, promises (with the boys promising Sayuri that they will take her there someday), and of the unknown future. It is ever-present, though always out of reach, representing whatever it is that the young characters are hoping for. I would recommend this as a beautiful love story, with fantastic animation and score. Although it is overly-sentimental in places, it does have a huge emotional impact.